As of 11 December 2018, the China Animal Health and Epidemiology Center has confirmed a total of 87 African swine fever (ASF) cases in China, appearing in 57 cities in 21 provinces across the country. Correspondingly, more than 631,000 pigs have been culled, accounting for 0.2 percent of the domestic live pig stock at present. Among these infected areas, Liaoning Province in north-east China has reported the largest number, with 18 cases in total. It is also noticeable that the first case of ASF virus on a wild boar was confirmed on 16 November in Jilin Province, which is adjacent to Liaoning. As shown in the map below, since its first outbreak on 3 August in Liaoning Province, ASF has spread from north China to south China, and across the country from east to west. As confirmed by China’s Ministry of Agriculture and Rural Affairs, ASF has been reported in 57 Chinese cities across 21 provinces, while Shaanxi was the most recently infected area, with a case confirmed there on 2 December. - Spreading by personnel and vehicles that are contaminated with ASF virus: such people and vehicles transporting live pigs might also have spread ASF if they had visited infected areas and then entered non-infected areas without thorough disinfection. This category is the major cause of ASF spreading in China, accounting for nearly 46 percent of all cases. The augmented price gap between different Chinese provinces has a major feature of China’s pork market since August 2018. It’s a disparity that could be attributed to the frequent outbreaks of ASF and the domestic environmental policies of earlier years. Especially in the latter case, many small- and medium-sized farms that fell below official standards were forcibly closed or demolished, while several large-scale pig-breeding enterprises had to move from the south to the north, and from the east to the west. Considering the impact of environmental policy since 2015 and the outbreaks of African swine fever since August, China’s domestic pork market can be classified into two groups: pork production-surplus provinces and consumption-lopsided provinces. As shown in the following chart, the price difference among typical provinces has been aggravated by the ASF outbreaks, especially after the trans-provincial transportation of live pigs was banned. Zhejiang and Sichuan, located respectively in south-east and south-west China, are two typical consumption-lopsided provinces when it comes to pork. Due to the enforcement of environmental policies since 2015, the number of live pigs sold in Zhejiang has sunk by 12 percent year-on-year to 6.8 million head for the first nine months of 2018. Accompanied by the subsequent outbreaks of ASF in Henan, Jiangsu and Anhui, the transportation of live pigs from these provinces to Zhejiang has been blocked, further aggravating the short supply and soaring price of pork in Zhejiang. The local live-pig price increased by 40.2 percent from ¥14.3 (£1.63) per kilogram on 23 August to ¥20.1 (£2.29) per kilogram on 19 September 2018. Similar to Zhejiang, the live-pig price in Sichuan Province also seen a rapid rise since the outbreak of ASF in China. Sichuan plays a vitally important role in China’s pork market, both in pork production and consumption. In 2017, the total number of live pigs sold in Sichuan reached 65.8 million head, surpassing all other Chinese provinces; meanwhile, its pork consumption per capita also ranked first nationwide, at 36.16kg per person in 2017. 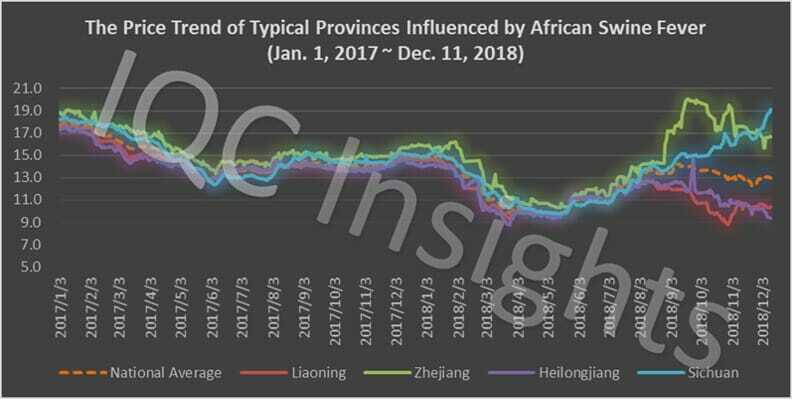 Despite the national live-pig price sliding from October 2018 onwards, the price in Sichuan has continued to rise, and the gap between it and the national average price widened further during the same period. The major reason for this is that ASF cases were reported, one after the other, in Yunnan, Guizhou and Chongqing from late October – all provinces that are adjacent to Sichuan Province. As a result, the transportation of live pigs from these areas to Sichuan was banned. On 15 November, 2018, the first ASF case was confirmed in Sichuan province, further pushing its live pig price much higher than other provinces. In contrast, pork prices in Liaoning and Heilongjiang tumbled between August and November – these are both production-surplus provinces when it comes to pork, and the outbreak of ASF has disabled their pork transport to other provinces, resulting in overstocked pork in local markets. For example, the largest price gap for live pigs reached ¥10.2 (£1.16) per kilogram between Liaoning and Zhejiang on 29 October (Liaoning’s live-pig price had decreased by 30.2 percent from ¥12.6 (£1.44) per kilogram on 3 August 2018 to ¥8.8 (£1) per kilogram on 29 October 2018). According to the latest data from Chinese customs, China’s pork imports totalled at 923,052,233 tonnes over the past nine months, slightly growing by 0.3 percent compared with the same period from last year. Especially between this June and September, pork import volumes stayed a little above levels from those seen in the previous year. Among pork exporters to China, Hungary and Belgium’s exports to China have been suspended since 7 May and 14 September respectively, after the outbreak of ASF was confirmed in these two countries. In 2017, Belgium exported a total of 6,806 tonnes of pork and 21,317 tonnes of offal to China, with a share of 0.6 percent and 1.7 percent respectively among all pork exporters to China. As for Hungary, its market share was 2 percent in pork and 1.1 percent in offal during the same period. However, when assessing the impact of ASF from the above countries, the major concerns are not over whether other pork exporters can replace them in China’s pork market, but over the risk of ASF spreading in other European countries – especially for France and Germany; the village that reported Belgium’s first ASF case was only about 20km from the French border and 65km from the German border. Once ASF has been found to be present in a foreign country, it is very likely that all imports from that country would be banned immediately. Another factor that no exporters can afford to neglect is the ban on transporting (frozen) pork products in China. As shown in the map above, those blue areas are also banned from transporting live pigs mainly because they are close to the infected provinces. Some local governments could take stricter measures to prevent the outbreak of ASF, for example, by prohibiting any pork products from entering local markets. Such measures would present great obstacles to the circulation of imported frozen pork within China.